Being spiritual is all well and good, but this guy went a bit too far. On his back you can see an Aztec deity in Ouroboros form, a Chinese character for tiger, and to top it all - some Hebrew writing, referring to another pagan deity. The Hebrew states, in a grammatically correct way: "Kali is one, and he's everything". Unfortunately, Kali is a goddess, she's very much female. The tattoo made her into a male. The Hebrew language is very gender-specific, there are actually 3 male words in that 5 word tattoo. I can't help but feel that this gender-bender tattoo is just deserts for someone who thought it was clever to tattoo his devotion to a pagan goddess in Hebrew of all languages. * Thanks to Tian from Hanzi Smatter for translating the Chinese character! By the description in Shoftim and elsewhere it seems like the ancient Israelites worshiped pagan deities frequently. Using Hebrew seems very appropriate. No, it is not. Like, at all. The fact it is mentioned never means it's condoned. Quite the opposite, actually. It is always mentioned in a negative context. i agree with the other comment. it's silly this person didn't research enough to know he should use feminine words, but i don't see why not hebrew. jews are not supposed to get tattoos anyway, remember? Why not Hebrew? I didn't address that in the post since I see it as a given, so I will elaborate. Sure, the Israelites worshiped pagan deities often enough. Still, the Hebrew language isn't associated with any of them, it's connected to the Judeo-Christian God alone. God who is very jealous and intolerant of any other deity. That's why using Hebrew in worship of a Hindu goddess is grating. It's totally misplaced. "ki ele" stands for "because my god..."
At first when I saw this tattoo I thought he meant Eli and somehow put in an extra KUF. 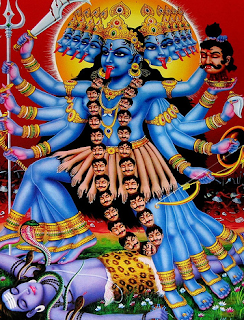 I do think he meant the Hindu goddess though, as Kali is associated with eternity, snakes and tigers. Could be האל הוא אחד, with an extra apostro-yod added for good measure. "you can only scavenge from other cultures so much before something goes wrong..." HAHAH TOO FUNNY. this looks like a very random (and self-contradicting) tattoo. clearly he put no thought into the different cultural/religious implications of judaism (represented by the Hebrew text), buddhism (by the chinese symbol) and Hinduism and the fact that these religions have extremely different viewpoints and often contradict one another. why would you use HEBREW text to worship a HINDU goddess? very confusing tattoo in and of itself BEFORE any misspellings. Is it bad that this is the first phrase I can fully read without nikkud?